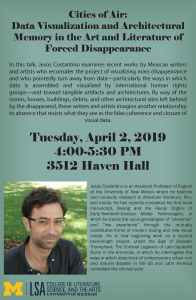 In this talk, Jesús Costantino examines recent works by Mexican writers and artists who reconsider the project of visualizing mass disappearance and who pointedly turn away from data—particularly the ways in which data is assembled and visualized by international human rights groups—and toward tangible artifacts and architectures. By way of the rooms, houses, buildings, debris, and other architectural sites left behind by the disappeared, these writers and artists imagine another relationship to absence that resists what they see as the false coherence and closure of visual data. 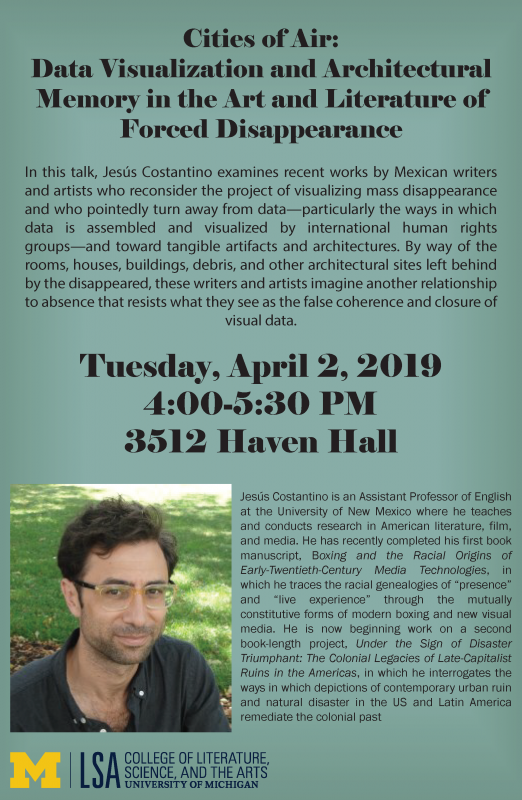 Jesús Costantino is an Assistant Professor of English at the University of New Mexico where he teaches and conducts research in American literature, film, and media. He has recently completed his first book manuscript, Boxing and the Racial Origins of Early-Twentieth-Century Media Technologies, in which he traces the racial genealogies of “presence” and “live experience” through the mutually constitutive forms of modern boxing and new visual media. He is now beginning work on a second book-length project, Under the Sign of Disaster Triumphant: The Colonial Legacies of Late-Capitalist Ruins in the Americas, in which he interrogates the ways in which depictions of contemporary urban ruin and natural disaster in the US and Latin America remediate the colonial past.